Loved using their service! Got my website designed by them and they did a great job. Will surely hire them to help me develop a part of my site. My website was beautifully designed and I was charged very resonably for what I got. Keep up the good work! Couldn't have asked for better support. I'd totally recommend them to anyone who wants to outsource their company's support. Initially I was scared to let HostechSupport change a few things like keywords on my website, but after they did, traffic increased by quite a huge margine. Well done HostechSupport. They did a good job in helping me develop the backend of my website. The whole support team is very friendly and they fixed my problem almost instantly. My company's sales support is handled by them and I must admit, they're pretty good at what they do. I will surely continue to use their service. Three cheers for your technical knowledge and prompt Customer service! Had a few things done on the server like installing ssl certificate, adding mx records and few others. They completed the job as I wanted. HostechSupport is very useful and they're quite cheap compared to others when it comes to managing servers. Keep it up! The staff is very friendly and my website got more hits thanks to them! My site's sales support is completely handled by them and I don't think anyone else would have done a better job. I wanted live chat feature on my website and hence hired them. They are very good at it. Started a website to sell all my handmade goods online and they helped me with everything from scratch. I wanted a theme for my website and also someone who could help me with the backend. 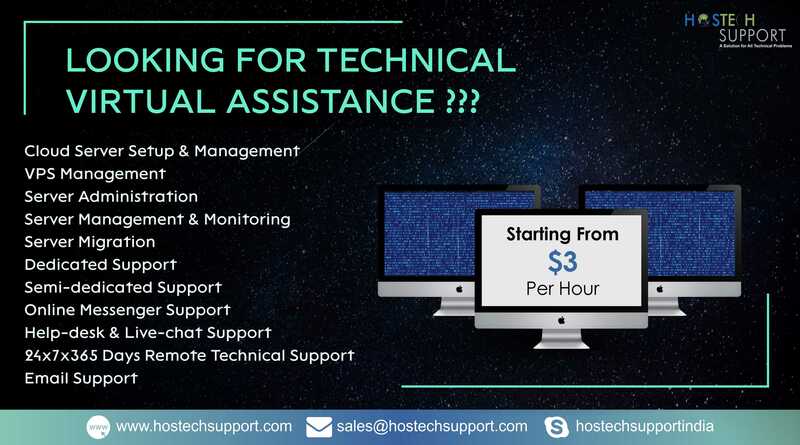 HostechSupport helped me with everything and their work was very good. Hired them to handle my website's support. They are doing everything exactly as I want. Very nice! I am without a doubt, Most grateful to work with HostechSupport!! They really helped my company from being under attack with malware infection to our servers where that host thousands of files.!!! They are expedient, polite and most importantly, trustworthy! I will forever continue to use them to manage my servers and all other security measures from this point on out! Thank you so much HostechSupport for your tremendous amount of support that you gave to our organizaton. You really deserve 10 stars! They have been perfect in resolving my issue with the Server Security. I can vouch on them. keep it up. HostechSupport is a kind and genuine company. They know how to get the job done and do it with no stress. I would highly recommend them to anyone looking for support for their business. Their written English is excellent and I have never had a trouble communicating with them.I feel they are a credit to any company that uses their services like providing technical server/customer support to small and large business across the world. HostechSupport, not only, has professional but also nice, pleasant & happy techs and a pleasure to work with, while providing their services.